" " Thanks so much for this video, I only watched it once, and I am already making welds that break easily" !.. " Yougizmos.com guy tries to show us how to make a basic weld.Turns out this video is a better "learn how not to weld" lesson. I don’t generally like to criticize other peoples welds but this one begs for some comments. How would you like to be driving down the highway behind someone pulling a boat trailer who welded their hitch like this. According to the guy in the video, you always want to use the minimum amount of voltage to weld so that you don’t melt thru the metal….. This is just flat out dangerous. Lets back up a minute…..Things are made out of metal for a reason. Strength and durability being 2 main reasons but there is a third reason…PREDICTABILITY! That’s right we need to be able to predict when something will fail. But when you make a weld like this on steel that is otherwise strong durable and predictable, now you have something that will fail in a very unpredictable way, like when you least expect it. Like when you are driving down the road at 70 mph hauling a boat. 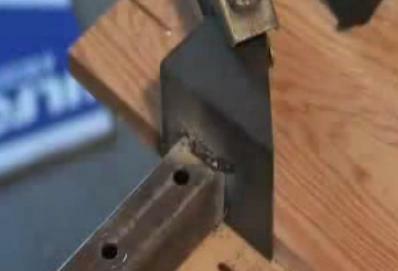 The weld shown in this video looks like it could be peeled off with a can opener. For the thickness metal being welded, that little Lincoln mig welder should have been maxed out. Instead of being afraid of using too much voltage, the guy should be concerned about not enough voltage. This is the problem with 115v mig welders. Anyone can buy one at Home Depot or Lowes and go home and weld anything…or TRY TO WELD that is. There are no welding police to come by and inspect your work or keep you from welding something that you have no business welding. Its kind of like street bikes like a Kawasaki Ninja. Any 16 year old with a wad of cash can waltz into a bike showroom and drive away with a bike that goes close to 200 mph. But how many 16 year old kids are capable of handling that kind of power. But they are free to try …What a country! In the same way, anyone is free to buy a 115v mig welder and try to weld something that might kill someone if the weld fails. And then you take a guy like Sean in this mig welding video, who pretends to know what he is teaching, who not only demonstrates how NOT to weld, but also tells you to quench the piece in water when you are done. Another bad practice. Be careful out there…especially when you are behind a boat trailer.